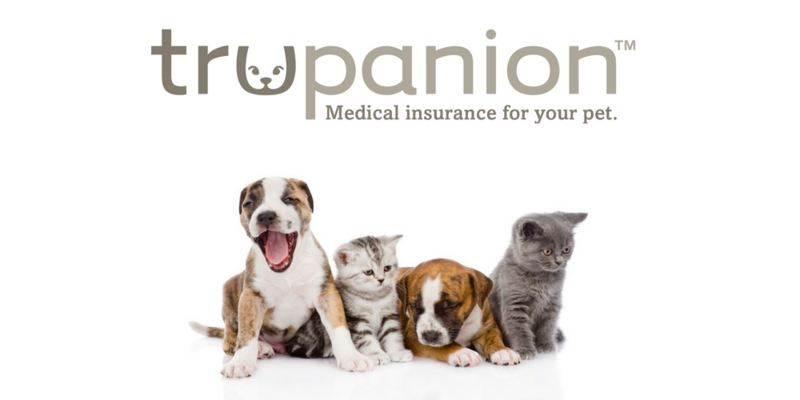 Trupanion is a Seattle company dedicated to bringing more technology and disruption to the pet insurance industry, with their Vet Direct Pay product. Trupanion claims to cover 90% of all approved veterinary expenses, including diagnostic testing, medications, surgeries, hospitalizations, prescription pet foods and supplements, hereditary and congenital conditions, prosthetics and orthotics. Trupanion does not cover exam fees and there are some exclusions for pet food and supplement coverage. Trupanion also does not cover wellness or preventive care, and as all other pet insurance companies, they do not cover pre-existing conditions. Alternative therapies, such as bone marrow transplants, treatment with colloidal silver, gold seed therapy, hyperbaric oxygen therapy, stem cell therapy, shock wave therapy, plasma injections and others, are covered. Other therapies are covered under the Recovery and Complementary Care Rider, which includes physical therapy, acupuncture, chiropractic, behavioral modification and therapy, naturopathy, homeopathy and hydrotherapy. Trupanion does not offer a multiple pet discount. There is a 5-day waiting period for injuries and a 30-day waiting period for illnesses before your policy is active. Any injury or illness that occurs during the waiting period will be considered pre-existing and is not covered. There is also an 18-month waiting period for opposite leg cruciate injuries. Trupanion boasts no payout limits, terms and conditions apply. Trupanion also has an upper age limit of 14 years of age. With Trupanion, you have some flexibility in terms of deductibles. You can choose anywhere from $0-$1000 and your monthly premium will fluctuate depending what you choose. With Trupanion, they are unique in that they offer what they call a ‘Lifetime Per Condition’ deductible. This means they cover anything related to your pet’s condition at 90% for their lifetime. In some ways, this is good if your pet develops a singular chronic condition. Conversely, if your pet develops a couple of problems and is seen for more than one thing at a time or within their life, you will have to pay the deductible each time for every condition. Most other companies work off of an annual deductible, so you can at least estimate your family’s financial out-of-pocket commitment for that year. With Trupanion, if your pet gets diagnosed with multiple things, it can still be a very expensive year. This certificate is a way for pet owners to try out pet insurance for a month, waive all pre-existing condition clauses, upfront costs and waiting periods. Typically, this is given out by a participating vet or by an adoption agency to healthy pets. Each subsequent treatment during this time period would be subject to a $250 deductible. From there, you can turn your certificate into actual insurance coverage. Trupanion is much different than other pet insurance companies in that it works with vets in real time, direct pay. If your vet participates in this program and uses the Trupanion software, they will get the claim approved and processed onsite. This saves you the worry of having to shell out money up front and wait for reimbursement. If you already have a vet, you can tell them about Trupanion’s program and get them enrolled in direct pay, or you can choose one of the veterinarians already in the program. With direct pay, you do not need to file a claim at all, you will just pay your portion of the bill at the time of services. There is no need to file claims with Trupanion if the vet office works with them directly – you just make your payment in the office and the veterinarian office will deal with the claim. You can visit any veterinary clinic, but only those in their ‘network’ will be paid directly, the rest you have to pay and they will reimburse you. Pet Owner Assistance is a $4.95 per month add-on that includes things like cremation and burial services for deaths due to accidents, boarding coverage in case you are hospitalized, liability coverage, advertising and reward and holiday vacation cancellation costs.